(b. 1988) – journalist and reporter. Graduated from the Inter-Faculty Individual Studies in Humanities at the University of Wrocław (in sociology, journalism and Dutch studies) and from the Polish Reportage School. 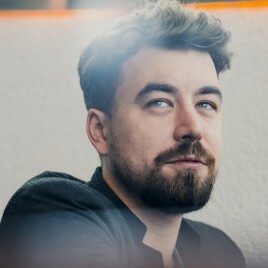 His texts have been published in „Duży Format”, „Przekrój”, „Wysokie Obcasy” and other magazines. Several times nominated for the Teresa Torańska Newsweek Award in the Young Talent category. Award-winning in the 5th edition of t­­­he Ryszard Kapuściński scholarship. Authored the book Wszystkie dzieci Louisa. Collaborates with the Institute of Reportage. Currently works on a collection of reportages about today’s Netherlands.